Grant Shapps is urging councils to move away from Whitehall control and make the most of the new freedoms they have been given. In a speech to council leaders in Marylebone, the Local Government Minister argued that years of centralisation had left some authorities in a “strait jacket”. While many councils were embracing these reforms, the minister warned that others had developed a “Stockholm Syndrome” - that, tied to the “nanny state apron strings”, they continue to look to central government to tell them what to do rather than deciding for themselves. Instead, the minister said all councils should make the most of the freedoms they are being given, and introduce bold and new ways of working to deliver not for Whitehall, but for their residents. Watch a video of Grant Schapps’ speech. 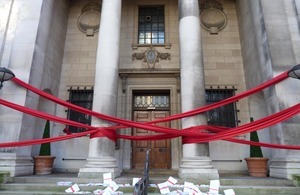 To illustrate the new freedoms that councils now have, Mr Shapps cut swathes of red tape engulfing one of Westminster City Council’s buildings and recycled piles of papers detailing the regulations that Westminster are looking to scrap. The minister’s comments came as Westminster City Council revealed that they spend nearly 3 quarters of a million pounds reporting to government - the equivalent of the salaries of 26 teachers, 28 social workers or 44 street cleaners.